Portland is building a bridge won't allow cars to cross! America's first ever multi-modal bridge, which will be used for public transportation only, will carry light rail trains, buses, streetcars, cyclists and pedestrians. 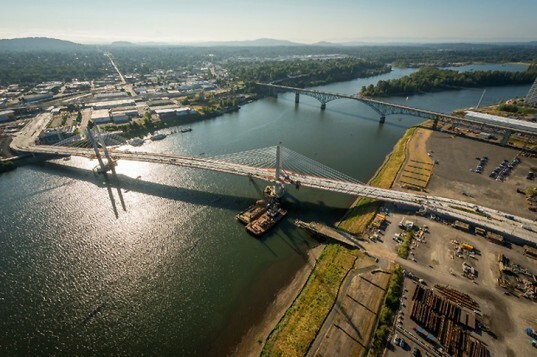 The 1,700-feet-long bridge will help reduce commute pressure of other regional bridges and will boast a custom designed responsive lighting system that will reflect changes in flow of the Willamette River below. Built by Portland-based public agency Trimet, the Tilikum Crossing is scheduled for completion sometime next year. A few weeks ago, the two ends of the bridge were finally connected, showing the outline of the final design. 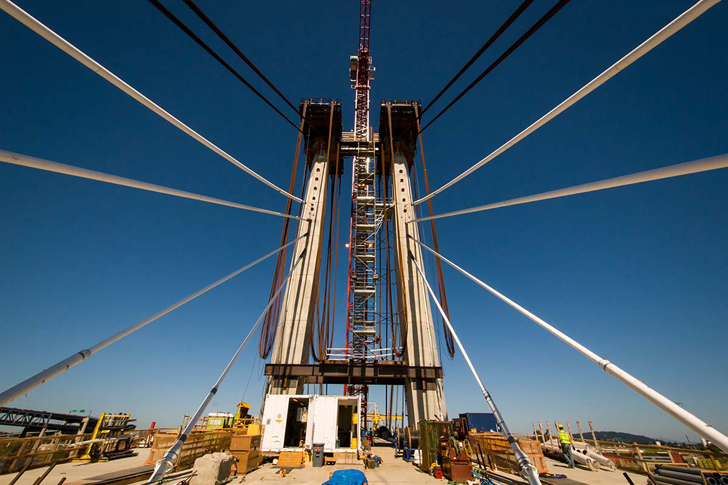 The bridge has several unique features that make it superior to other similar projects, including its H-shaped towers that are smaller than those of most cable-stay bridges. Single cables run through the towers and connect to the deck, and offer an efficient substitute for the commonly used two sets of cables that are connected separately to the towers. Portland’s history is marked by city planning oriented towards public transport that favors pedestrian commuting and transit-oriented infrastructure. Robert Moses’ 1970s plan to build an east-side freeway was stopped thanks to a citizen-run campaign, resulting in reorientation of federal funds towards building Portland’s first light rail line, which was among the first ones built in the United States since WWII. Replacing a multilane along the Willamette River, a park was built in 1980s. Related:Sunken Pedestrian Bridge in the Netherlands Parts Moat Waters Like Moses! According to Trimet’s executive director Blocher, the decision to restrict car traffic was made in accordance with the infrastructural configuration of the site. There are no roads leading to either end of the bridge. This project seems to continue Portland’s lengthy tradition of integrating land use and transportation planning and investing into public transportation which reduces the city inhabitants’ reliance on cars. The bridge has several unique features which make it superior to other similar projects. For example, its H-shaped towers are smaller than those of most cable-stay bridges. Portland’s history is marked by city planning oriented towards public transport that favors pedestrian commuting and transit-oriented infrastructure. Trimet’s executive director Blocher said the decision to restrict car traffic was made in accordance with the infrastructural configuration of the site. There are no roads leading to either end of the bridge. Single cables run through the towers and connect to the deck, and offer an efficient substitute for the commonly used two sets of cables that are connected separately to the towers. A few weeks ago, the two ends of the bridge were finally connected, showing the outline of the final design.